The success or failure of a tree or shrub starts with the planting procedure. Once planted they need proper care until they are established and mature. When starting the process of planting new trees and shrubs, you first need to know what the tree or shrub is, what it needs, how to care for it, and if it will be successful growing in your climate. Next, be sure to have the correct tools and supplies. Shovels, water, fertilizer, and possibly top soil will be needed. Having all these items handy will allow for a smooth planting process and avoiding multiple trips to and from the planting site. Finally, it would beneficial to ask for help, especially when planting a larger tree or shrub or when the tree or shrub is a bare root. A bare root tree or shrub is when no dirt around and within the root system. Many trees will have a root ball, meaning a burlap sack that contains the roots and dirt. An additionally set of hands are helpful when it comes to handing tools, moving items, and placing the tree or shrub in its place properly. It is also beneficial to have an additional set of eyes to be sure the tree or shrub is placed straight and in the correct spot. 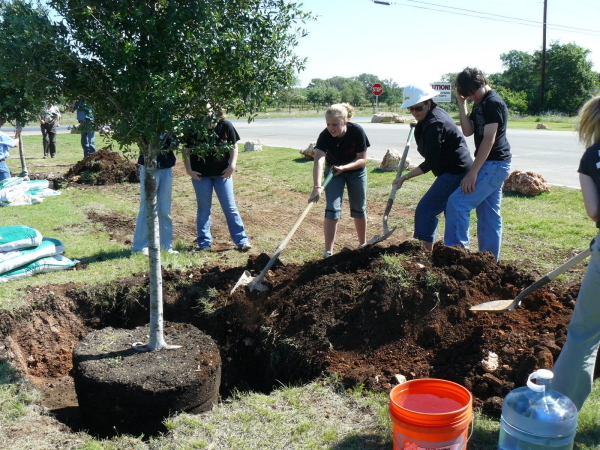 One of the most important steps when planting a tree or shrub is timing. Most plants will not do well if planted or transplanted in the hot and dry summer months, this can cause shock to plant and lead to the death of it. The best time of the year to plant trees and shrubs is after the tree or shrub has gone dormant in late fall or before new growth appears on the plant in early spring. After planting, depending on the type of tree or shrub, it is probably beneficial to apply a root stimulator type fertilizer that is high in phosphorus to assist in the growth of the root system. Watering is essential to a newly planted tree and shrub. Regular watering encourages rapid root growth while under watered trees and shrubs will have slow establishment, canopy dieback, and bark splitting on the trunk. It is important to be on the proper watering schedule and watering the proper amount at the proper time throughout the day. Watering in larger amounts on an infrequent schedule does not make up for missing a lighter, more frequent watering. It is important to check soil conditions before watering each time to ensure that it is needed. Newly planted trees and shrubs do not fare well when over watered. When caring for trees and shrubs, not all trees and shrubs are created equal. Research is the key for each particular plant being worked with. Lawn care services, tree service companies and nurseries are excellent resources to ask questions and get recommendations from. If you are ever unsure of what to do, how to handle a job, or just too short on time it is best to call a professional to be sure the job is being done correctly. Look around, ask friends or family, and research companies on the Better Business Bureau to find a company that you can trust.